Alex Todd (left) and Levi Gloden wash freshly harvested scallops aboard the Jacob and Joshua. It’s scallop season in Maine. Fishermen here have hauled in over 450,000 pounds of the tender delicacy in each of the last three years, but the state produces only a tiny fraction of the entire U.S. sea scallop harvest. So to grow a market for its own brand of inshore scallops, the Maine industry is trying to sell one particular quality that sets it apart. 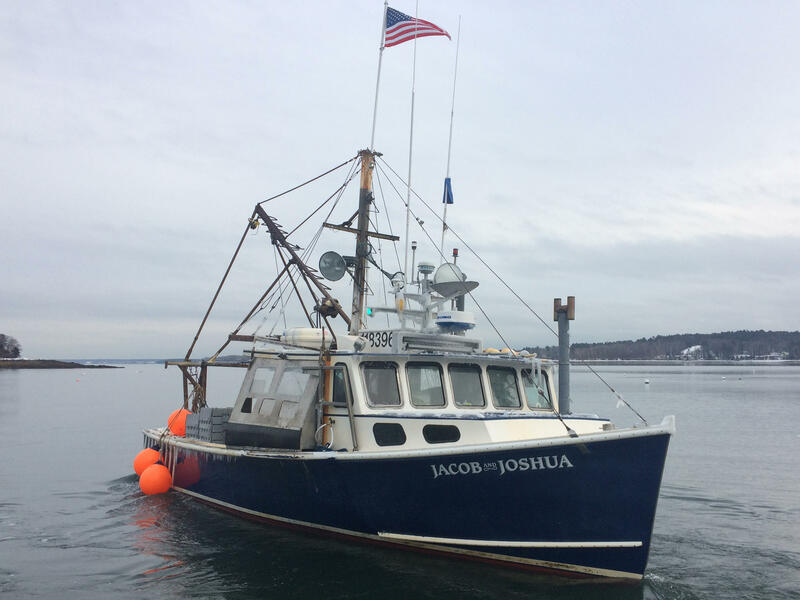 Just offshore from the Cousins Island town dock in Casco Bay, Alex Todd and his crew, Levi Gloden and Edward Lefebvre, are shelling scallops on Todd’s boat, the Jacob and Joshua. “We get rid of the stomach and the mantle and all that. And just put the abductor muscle in the bucket,” Todd says. 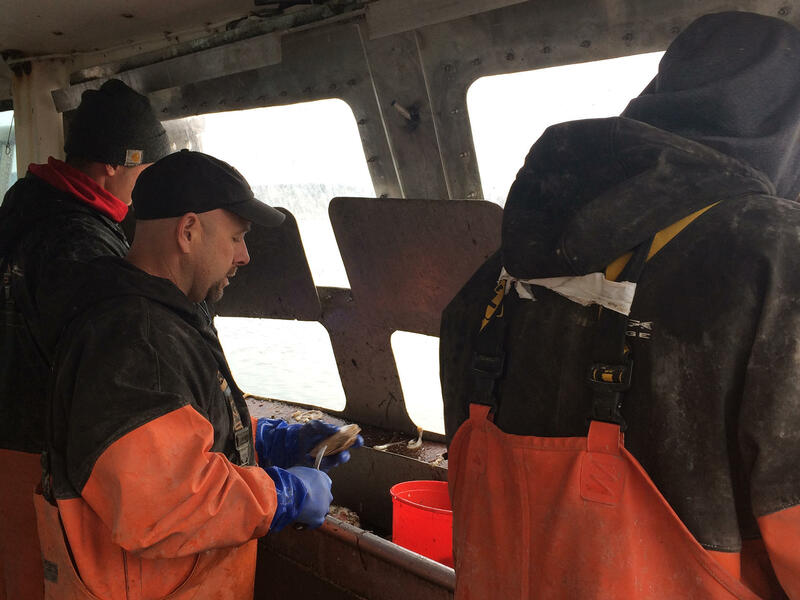 He is one of more than 600 licensed scallop fishermen in Maine, of which about 450 are active. He has been harvesting scallops for almost 30 years, and chairs the Scallop Advisory Council, a panel that makes recommendations about the fishery. In Maine, a few dozen fishermen dive underwater in scuba gear to harvest scallops by hand, but the majority of scallops in the state are harvested by draggers, like Todd. “We tow the dredge — we call it drag, the federal government calls it a scallop dredge — across the bottom. There’s chains on it that tickle the top and the bottom and flip the scallops into the link bag, which we tow a couple hundred yards behind the boat depending on the depth of the water. And after say, 15 minutes, we haul it back, see how many scallops are in it. Dump it out, start over,” he says. On a good day, like today, Todd hits his quota of 135 pounds of meat, or 3 buckets. “And yesterday we got ‘em a little quicker. But it’s still early. It’s still good — we’re happy,” he says. Lobster is Todd’s main focus. But like many Maine fishermen, he also fishes groundfish and shrimp, when they’re around and there’s a season for them. And as for scallops, Todd says Maine’s inshore harvest has a special appeal. “They’re still flipping, they’re alive. We bring ‘em in that day within hours, don’t soak ‘em in anything. They just couldn’t get any fresher. Usually when they move you can feel them pulsate,” he says. Most of what Todd and his crew haul in gets hand-delivered to customers right to their house or restaurant. But some go to dealers. 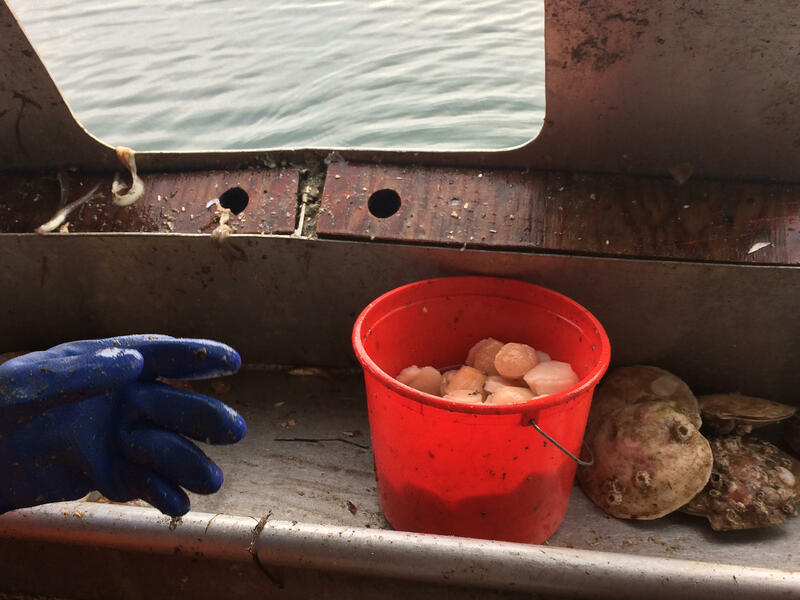 Togue Brawn’s company, Downeast Dayboat, focuses only on Maine dayboat scallops, the kind harvested and brought to shore in the same day by fishermen like Todd. Brawn drives up and down the Maine coast buying scallops directly from fishermen, and ships them to customers within 24 hours. Everything gets labeled with the name of the fisherman that caught them, the bay they are from and the date. 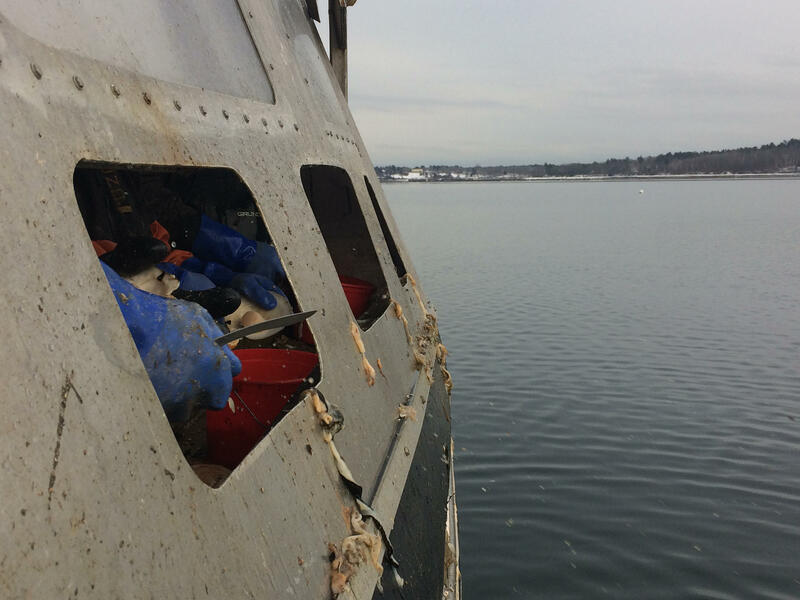 Alex Todd and his crew shell scallops aboard the Jacob and Joshua — the discarded parts go overboard. “They are coming from water that produces exceptionally flavored scallops. Just like oysters develop flavor profiles, depending on where they grow, so do scallops. But most people don’t realize that, because they are used to the water-logged scallops from generic offshore waters,” she says. Maine scallops only account for about 2 percent of all sea scallops in the U.S. The rest come from the federal fishery, mostly from offshore waters near the Georges Bank, and are brought in by large boats that go out for a week or so, catching thousands of pounds per trip. “There is a huge difference between a Maine scallop and a scallop from the federal fishery — absolutely huge. So if you can show that difference to more people, then they can realize ‘Oh wow, Maine waters produce something better. Maine fishermen have a better way of bringing in their catch,’” Brawn says. Shelled scallops aboard the Jacob and Joshua. “A lot of the big days-at-sea boats, you’ll get a 8-, 10-, 12-day-old scallop before it reaches land. Plus, a lot of places soak ‘em in some sort of solution to keep ‘em fresher smelling, and they add weight to it,” he says. Todd is talking about TSP, or trisodium phosphate, an additive that often gets used on scallops so they absorb more liquid, increasing their weight. “I think that if you want to get the most out of the Maine fishery, you’ve got to separate it from the rest of the fisheries out there. You’ve got to market it from a standpoint of what it is: a dayboat fishery that is traceability to the source,” says Dana Temple, who owns Crescent Bay, a wholesale seafood company, and has been involved in the scallop industry for about 40 years. By differentiating Maine’s scallops from the rest of the harvest, Brawn is hoping to build a market that can sustain Maine’s fishery. “Maine’s fishery is very small, it is a few hundred boats coming in with very small amounts of scallops in the far right-hand corner of the country,” she says. Brawn admits that her company’s effect on getting more consumers to recognize how special Maine’s fishery is small — for now. “I cannot buy enough to make a big difference. I make a small difference to a small number of fishermen. And I hope to grow that,” she says. Recently, fishermen were earning about $13.50 a pound for scallops. That’s more than three times the price they got in 2004. And Brawn says Maine scallop fishermen should be getting paid for what she calls a “super-premium” product. For now, she pays fishermen like Todd as much as $18 per pound. “Off the boat. If the price was still $7 or even at one point it was $4.50, it just wouldn’t be worth going, with the price of fuel and everything the way it is,” Todd says. Both Todd and Brawn have seen the state fishery rebuild since scallop landings collapsed to an historical low in 2005. Landings have improved, in part, due to measures imposed by regulators. But challenges — warming ocean temperatures and acidification due to climate change — still loom for the fishery. “I’ve seen more weird species lately, like 10-12 years ago I started seeing black sea bass that you hadn’t earlier in my lifetime,” Todd says. “We have a state-water fishery because our scallops can live within 3 miles of our shore. To our south, the waters close to the shore get too hot in the summer. So if our waters warm up too much, that could be bad, especially for the western part of the state,” she says. The annual International Pectinid Workshop, which brings together scallop scientists, industry professionals, students and fishermen, will be held in Portland in late April. Meantime, Maine’s industry will continue to work on its brand.